Thinking about upgrading to bigger engines? Aerodynamics is a Blackhawk dealer, based in the Isle of Man, predominantly covering the UK and Europe. If you are thinking of upgrading your aircraft to a Blackhawk. Contact us and let us answer any questions you may have. Are your engines due for overhaul? Why spend all that money and be left with high cycle engines and an aircraft that will give you the same level of performance? Upgrade to brand new Blackhawk engines and fly away in an aircraft superior to the one you delivered to the maintenance facility, with an increased appraised value. We ourselves have first-hand experience of the Blackhawk upgrade. We upgraded our Cessna Grand Caravan in 2012 with the 850hp PT6A-42A Blackhawk engine, making it the first Blackhawk Caravan in the UK. It is currently operated for skydiving by Black Knights at Cockerham. The aircraft gets their customers in the air and skydiving quicker than any other Cessna Caravan whilst using less fuel. 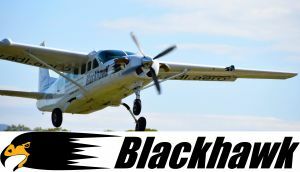 “We have leased the Cessna 208B Grand Caravan Blackhawk N208AJ for the past 2 years and found the aircraft excellent to operate. The Blackhawk comfortably takes 16 skydivers in style to 15,000ft operating off a 577m tarmac strip. The Blackhawk has worked out reliable and the pilots that fly it thoroughly enjoy doing so, they enjoy the climb to altitude (This aircraft comes into its own above 8000ft and will have a constant rate of climb to 15000ft) and especially the decent. I can easily get 3.3 lifts per hour to 15,000ft with multiple passes per lift. I use about 65 litres a lift in fuel. If I limit it to 12-13000ft as per a normal Caravan without the Blackhawk conversion I could easily do 4 lifts plus per hour" Paul Yeoman- Black Knight Parachute Centre.